Kleefeld on Comics: "Are You Reading... Backwards?" 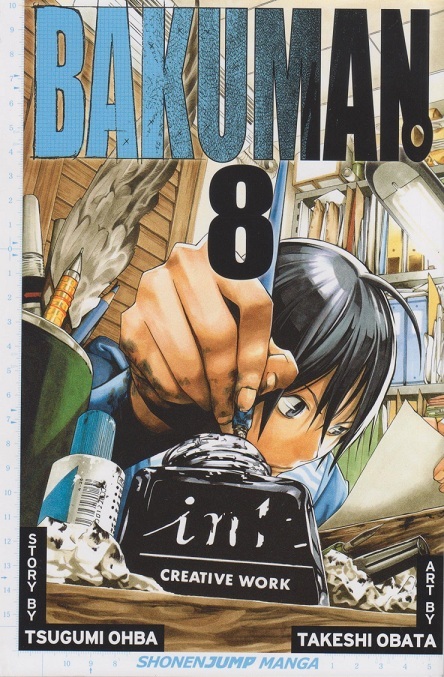 I went to Chipotle for lunch today and sat down with a copy of Bakuman. I found it was a bit difficult to juggle the manga and the burrito simultaneously, so I opted for a leisurely read after I'd finished eating. I wasn't timing myself, but I'm sure I was sitting there for over an hour. Mostly engrossed in the story. I got up periodically to refill my drink, and I'd occasionally catch some movement out of the corner of my eye, but for the most part, I just sat there with my nose in the book. At one point, I did see that a guy at the next table was looking over my way. I didn't think much of it, though. Then I got up for another soda, and noticed he was family man with his wife and young kid. On my way back, he was looking in the direction of my table again. All that was on the table at this point was my book and a closed Chipotle bag with my leftovers. My coat was draped over one of the seats, but he pretty clearly wasn't looking at that. So, given that the Chipotle bag is pretty generic in the first place and pretty common in a Choptle in the second place, I'm left to assume he was trying to see what I was reading. The book was facing cover up but, as you know, manga reads "backwards" so the cover image he was seeing was on the "wrong" side of the book. I noticed him glancing over my way a few more times before they left. I have to wonder what he was thinking. If he were already interested in manga and just wanted to know what I was reading, he could've easily seen that while I was getting my drink. Given the area I live in, I'm more inclined to think he's never seen manga before, possibly never even heard of it. If he had seen me turning pages "backwards" while I was reading -- not at all improbable since my seat was essentially right next to the cash register -- that might have looked very strange if he had never seen that before. I wonder, then, how many people that confuses. If you're sitting in a public space reading manga for a while, and someone who's never looked at the medium sees you, what goes through their heads when they notice you reading "backwards"? Is it an idle curiosity that slips their mind as soon as you're out of sight? Do they assume you're some weird performance artist? Do they think you're actually reading Japanese? Anyone have an experience where someone's actually asked you about manga while you were reading it?